Retrospectively to last year, we are maintaining our plans and vision, continuing our focus on international business. This led us to selling our hosting company GEM Studio that was focusing on Croatian market, it was sold to Croatian leader in hosting business Avalon d.o.o.. It also means we started a new company called Smart Queries Ltd. however we will work under the project name WhoAPI (tm). We presented WhoAPI on numerous events (HackFwd and Seedcamp are some of the popular ones), and received funding from one of the CRANE members. 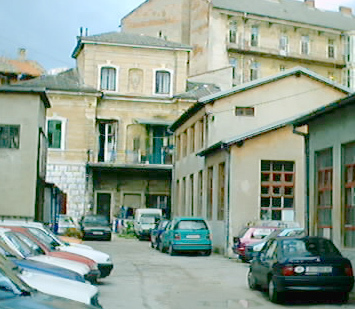 CRANE - Croatian Angel Network. As you can see from last year, what we intended, we achieved. 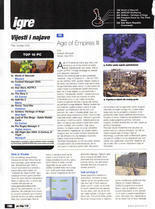 We sold our website igrice.hr - a game review web site, to the owner of igre.hr - biggest network of game websites in Croatia. We are drastically reducing our services in Croatia, down to web hosting. That being said, selling one of our oldest web sites is natural and we consider it a smart move. 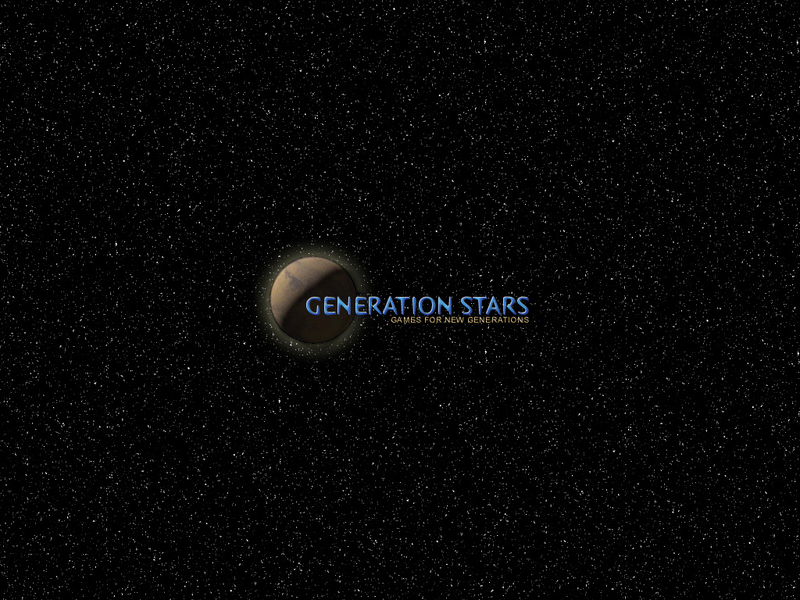 There's a chance of a comeback with Generation Stars development for iOS. 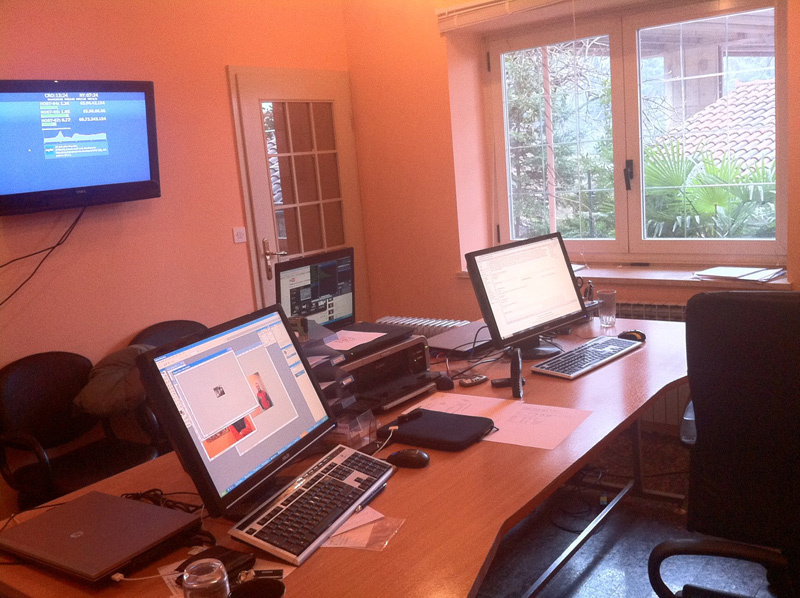 GEM Studio, the company we started 5 years ago, is a success! 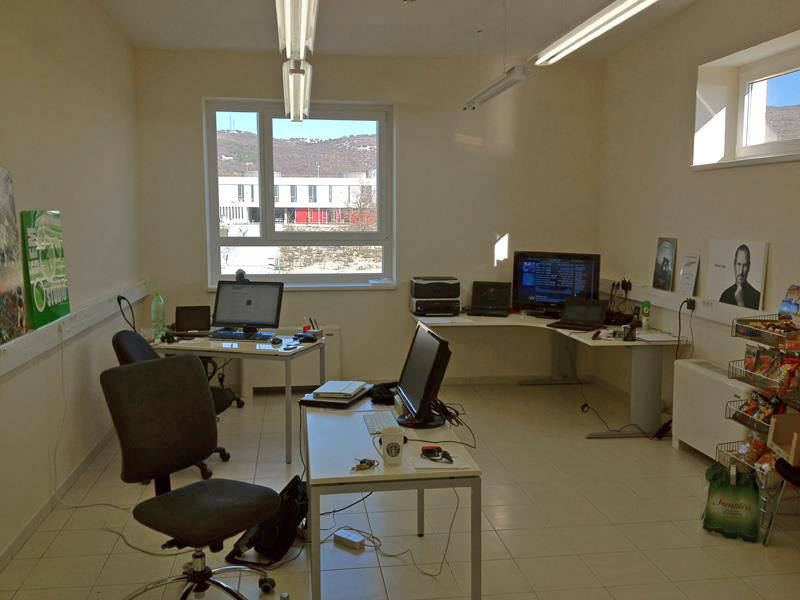 We are serving hundreds of happy clients and we're very happy with what we acomplished. Our office is equipped with everything we need. We are also starting a Startup and could use some funding from investors (foreign or domestic). A slow year for Generation Stars. Many members were fired and one even quit the job he loved. Bad year but a fresh start. We got a huge interview by a magazine called "Enter" on 3 pages; we were also mentioned few more times on other magazines and newspapers. 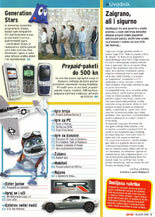 Also, we got Gink in Trouble all over the Croatia on shelves and on a most popular portal in Croatia "www.net.hr". 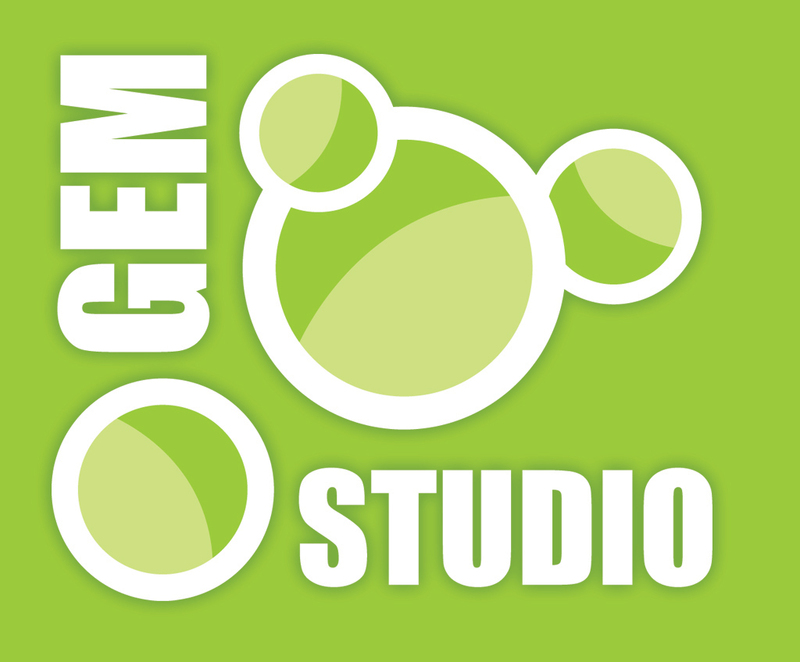 While Zombie Driver still in development we registered another company to make and sell web sites, GEM Studio. And without any luck, we're still working with zero profits. Some would say that every company needs a two years of work to gain a real profit. Today we make games, programs, websites, sell hosting, backups, fix computers, making game and other non-related portals .. all that just to make the first step towards success. This is the year of a turning-point. Accomplishments in this year by far most raised the ladder to a much higher level with much more quality and professionalism. There was work done as much as all these years. 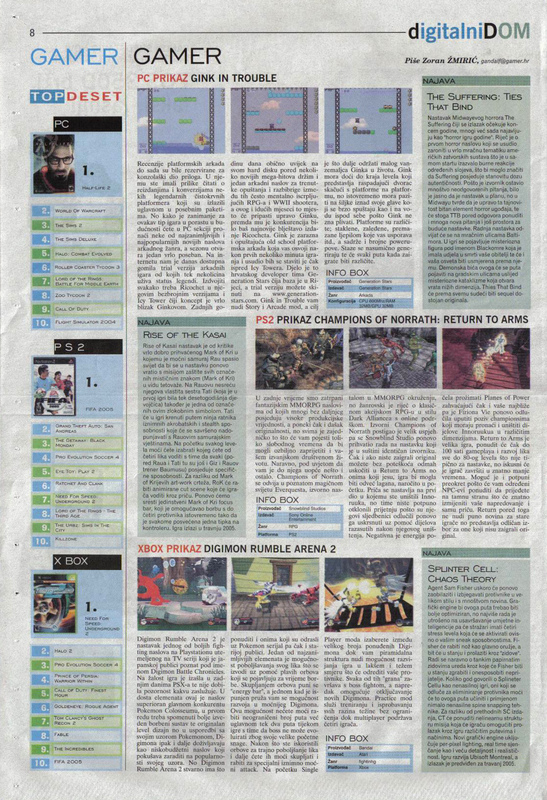 Not in one year before we made and released so many games, present on whole Internet, mentioned in the press, Internet portals and even on TV! And yes, new team member, Nikola. There were 10 new games, amazing! 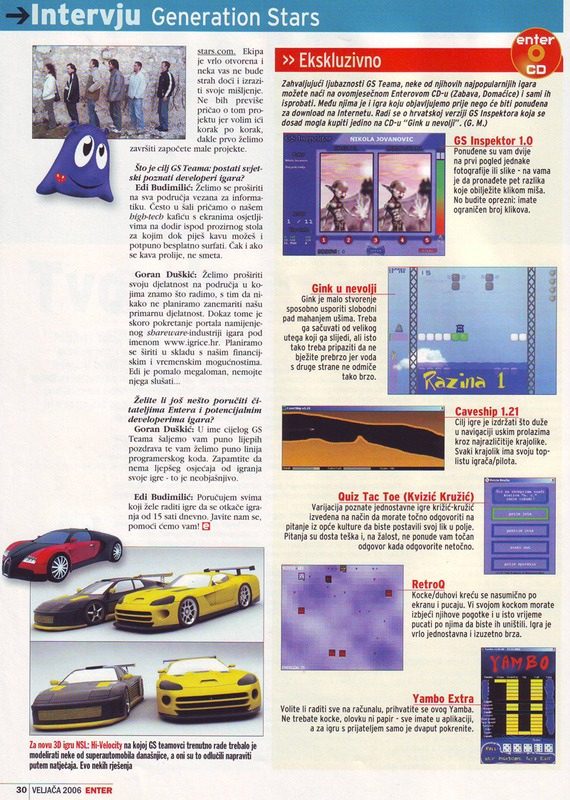 We also made localization on Croatian language for four our games, and also our website. 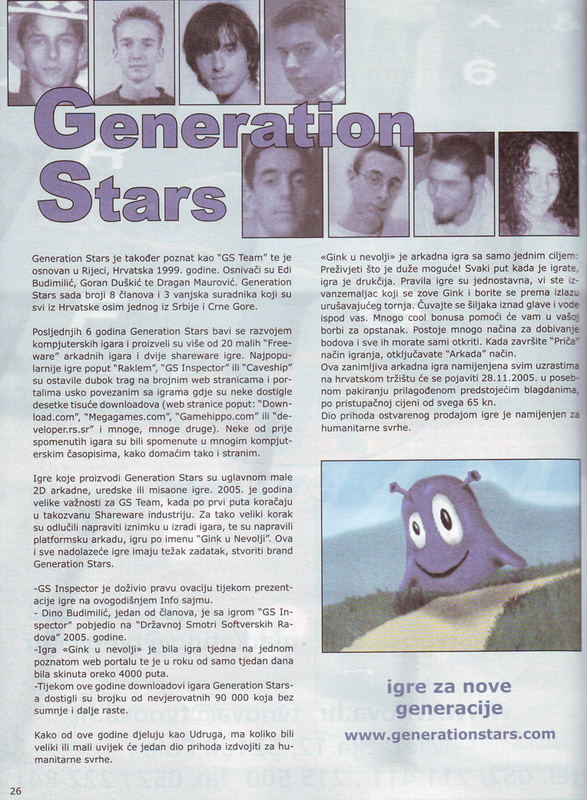 Together with opening of our Association under Croatian name 'Zvijezde Generacije' with the permission to use English name 'Generation Stars' we found a co-publisher and a distributor for Croatian market, Conor Ltd. In co-operation with Conor Ltd we released 'Gink u nevolji' (Gink in Trouble). Released and put in sale that is. Big co-operations with respectable companies are made. Companies like Iskon Internet and Log IT, and off course many other. Absolutely every existing record was broken in this year. Visiting records, new users, number of posts on our web site and on our forum. 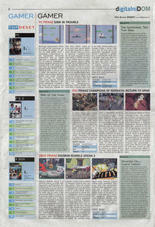 Records in sales, released games, new members, mentioning in the media, number of downloads of our games. Shortened, if there was a record it got broken in this year! 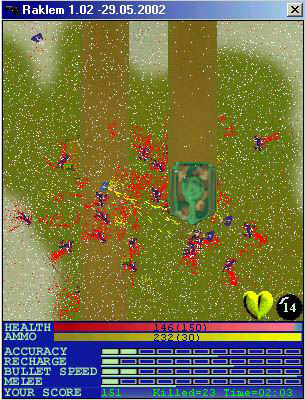 The year 2005 is remembered for releasing our first retail game, Gink in Trouble. 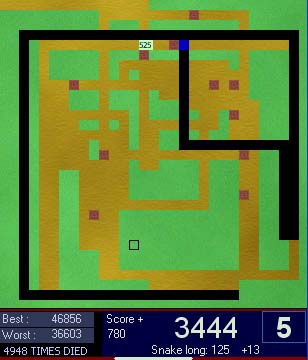 Although it seems as our least productive year, we have made 3 small Freeware games with Panic Invaders and Yambo Extra, the merged version of Yambo & Yambo 2. 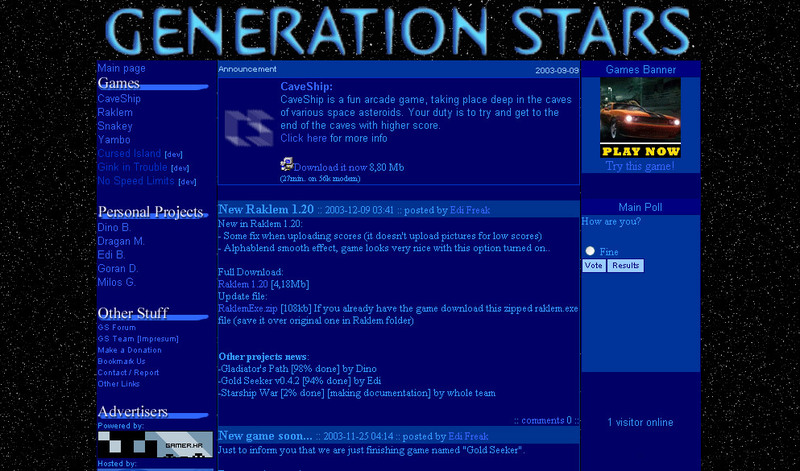 Also 2004 goes into history for it was then when we opened the domain name GenerationStars.com. This year is surely characterized as the beginning of professionalism under Edi's leadership. Off course we had new people on board. Mate Maksan joined as a member. 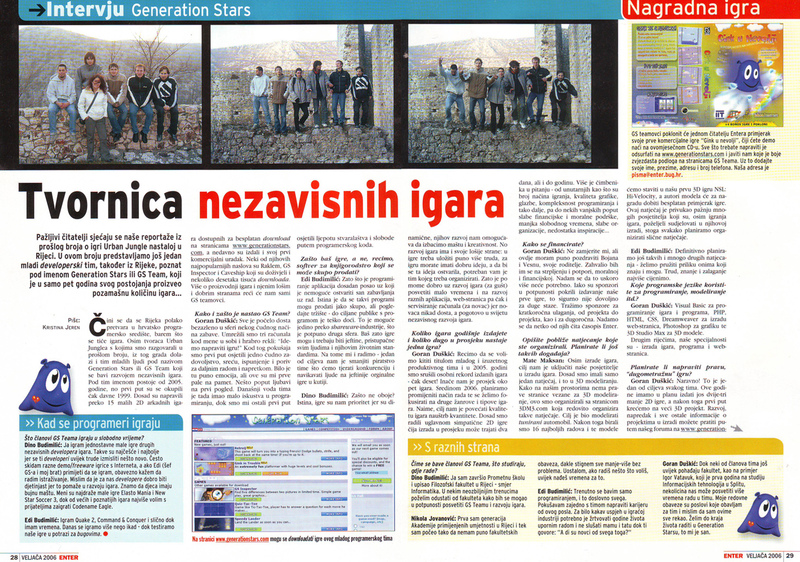 We were mentioned in newspapers "Nedjeljni vjesnik". Edi again as surely the brightest star makes and releases CaveShip, while Dino helped him. Dino also shows a talent with making Find 5. In the meantime new members Milos and Igor come along with great enthusiasm. Unfortunately Goran is inactive because of his move to another town and is beginning to loose touch with the team. 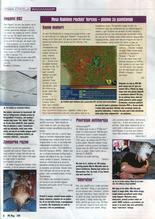 Again our games show up in magazines. This time it was "Bug". 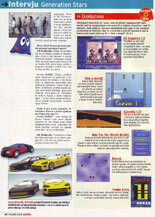 Two more small games Generation Stars released that year. By releasing Yambo and Yambo 2, Goran confirmed his place in the team, while Ivan and Luka were too occupied with their own business. 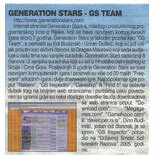 Dragan and new member Dino helped Edi in making and releasing Raklem, till now our most noticed game. 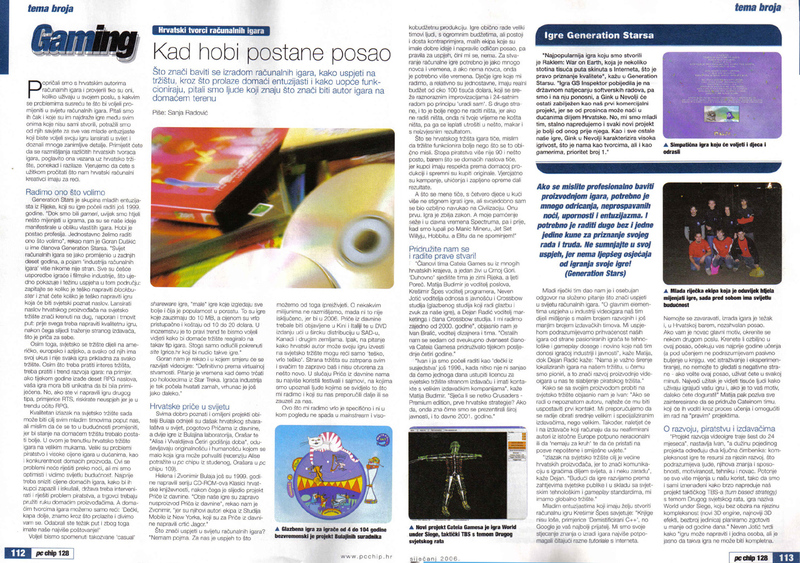 Raklem was the first game that found it's place on a CD of some magazine. Magazine name was "Hacker". 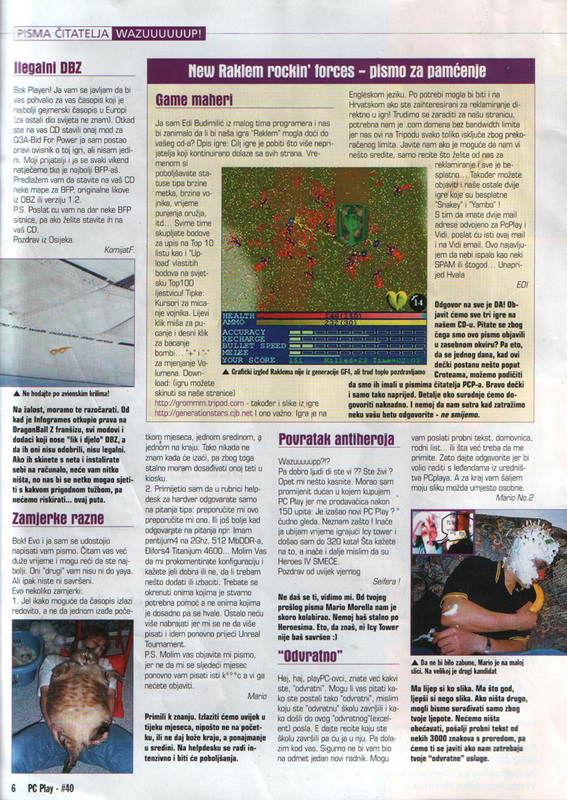 Because of Raklem we were mentioned in one more magazine, PC Play. 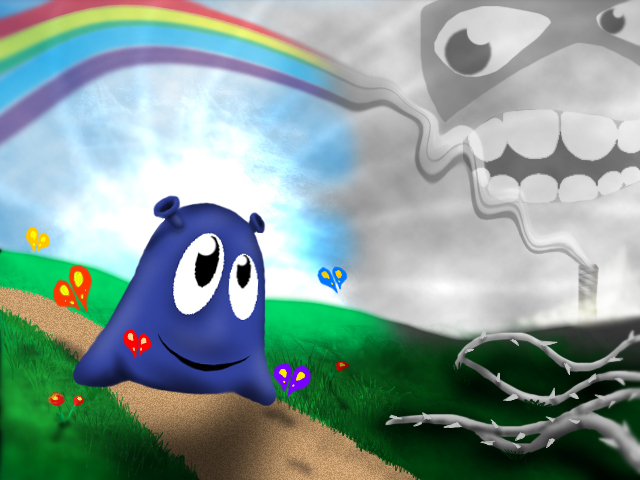 In mid 2001, Goran felt all the joy in making games, for the first time, looking at one of the very first versions of Snakey. When Sankey was released few of our friends wanted to make games. Dragan, Ivan and Luka were the first ones to jump to help Edi. Although at that time we didn't care much how are we called as a team or which our goals were. There was only desire for a new way of having fun. 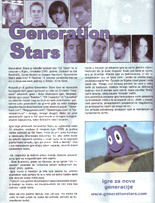 We hear for the first time "Generation Stars". When Goran bought his first PC, thanks to that Edi and Goran met. It is universally unknown how they heard about each other, but one thing is for sure, their interest for computers is the same. In this period Edi is preoccupied with programming small programs, and learning the basics of Visual Basic. Goran is not too interested in programming however he works on a web page dedicated to soccer news. Web sites name was "Football News". Edi too is a webmaster of a page dedicated to his programs and so called games, "Big Bear" is the name. Already here you can feel the presence of stars. Edi was then using the name "All Stars". You can say this was the name before the first real name.